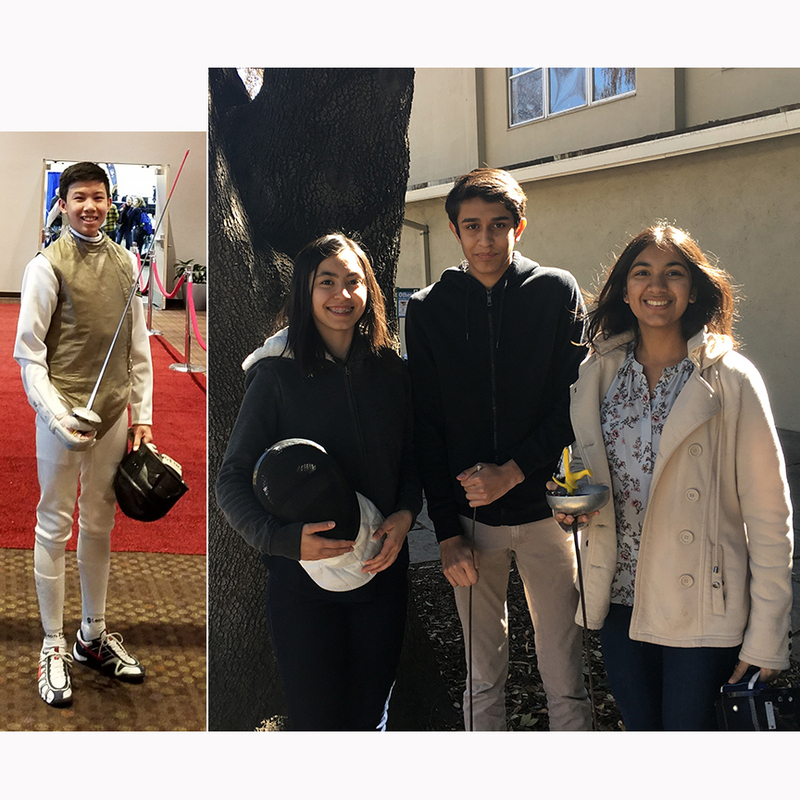 Four Harker fencers traveled to Memphis, Tenn., over the Presidents Week break to compete in the 2018 Junior Olympics Fencing Championships. Nerine Uyanik and Sana Pandey, both grade 10, and Ethan Choi and Kishan Sood, both grade 9, made the trip. Uyanik competed in cadet women’s foil on Saturday against 213 other women from across the United States, going 4-2 in pools, seeding 76th into the direct elimination table. She got a bye in the round of 264, then faced the 52nd seed who she flipped 15-13 to advance into the 64. Uyanik then toed the line versus the 12th seed and fought her to time, but lost 11-9 (bouts go to 15 touches over three 3-minute periods), ending up 59th, a very respectable finish. The previous day Uyanik joined two club mates from the San Francisco Fencing Club to take fourth place out of 12 teams. In that event, SFFC No. 2 women dominated the Mt. Airy/Wallingford Swarthmore Panthers 45-6 to advance to the next round where they faced SFFC No. 1 women, the “A” team from their own club. SFFC No. 2, including Uyanik, threw a twist into the universe when they beat their club mates 45-41 in a brutal match that saw Uyanik’s team take an immediate slim lead and hold it through most of the match to bring in a 45-41 victory. They then faced Gutkovskiy Fencing Academy, the eventual gold medalists, where they kept the fight tight, but lost 36-30 when time expired. Finally, on Monday, Uyanik competed in the junior women’s foil event, including fencers up to age 19, where she split her pool 3-3, seeding 101st into the elimination table. She ran up against a tough opponent in her first direct elimination round and lost 15-8, finishing 136th out of 233 starters. Uyanik has qualified for JOs for three consecutive years and is a “B-rated” fencer (ratings run A-E, plus U for unrated, based on tournament results). Pandey, grade 10, fenced in cadet and junior women’s epee events, Friday and Sunday, respectively. Pandey reached a milestone in December when she earned her “C” rating at the local JO qualifiers. This was Pandey’s first JOs and only her third national event, so she encountered a steep learning curve, as well as faced the eventual gold and bronze medal winners in her juniors pool, thus did not advance out of pools in either event. Pandey fences for International Fencing Academy. Choi, grade 9, also attended the JOs, fencing in cadet and junior men’s foil events. In the cadet event, Choi seeded 50th out of 287 fencers and split his pool 3-3, losing each bout by two touches, so only six touches away from a perfect pool, thus dropping to 137 seed going into the elimination table. In his first elimination round, Choi flipped the 120th seed 15-9 to make the table of 132, then lost to a local powerhouse from Santa Rosa 15-8 to finish 116th. In the junior event, Choi seeded 223 out of 282 starters. He started off with a very solid 4-2 record in pools, seeding 113th into the elimination table, but dropped his first elimination bout, so ended up 149th in juniors. Choi is a D-rated fencer and fences for Massialas Fencing Team. Sood, grade 9, also fenced in cadet men’s foil, splitting his pool 3-3 to advance to direct eliminations in the 152nd slot. Matched up with the 105th seed, Sood fought a very tough fight, taking the score to 14-14 before his opponent made the final touch. In the final standings, Sood stood 162 out of 287 starters, a solid finish in that age bracket. Sood has an E rating and fences for California Fencing Academy, as does his sister, Ishani, grade 6. Pandey and Uyanik are co-presidents of the Harker Fencing Club, which meets Tuesdays and Thursdays in either the atrium or auxiliary gym.